Sorry to be late! oopsie, lol! Dave hurt his Achilles tendon. Dave got a walking boot and the EP from Jessica & John. Chuck & Wynona went fishing at the detour. Dave & Connor used the EP at the detour, and they got to the pit stop first... But the leg is not over yet! Will Dave & Connor continue? And who will be eliminated next? PS, can someone update today? I have a 1000+ word essay to do for a scholarship due in about 4 hours... which uhm, is kind of super rough still. Rewards are endless during spring daylight savings. Leg 3 Pit Stop: Christchurch, New Zealand. Dave & Connor open the clue. Fly to Bali, Indonesia. Then proceed to Monkey Forest where a monkey will give the next clue. They decide to continue. Jessica & John are team #2 at the pit stop. They hope to extract as much value as they can from the EP. Bates & Anthony are team #3. Pam & Winnie are team #4. Joey & Meghan are team #5. Caroline & Jennifer are team #6. Mona & Beth are team #7. Max & Katie are team #8. They didn't even show teams finishing the shemozzle RB. Chuck & Wynona bowing at the Pit Stop was priceless! Max & Katie call in to get tickets. The earliest flight arrives at 8:30 AM. They reserve those tickets. Chuck & Wynona are the last team to arrive... but they're still racing! Dave & Connor get on the 8:30 AM flight too. Pam & Winnie get the 8:30 AM flight as well. Joey & Meghan and Jessica & John can't find any flights. Mona & Beth and Bates & Anthony get some directions to the travel agency. Caroline & Jennifer are trying to get the best connection... Max & Katie arrive to see Caroline & Jennifer. Max & Katie tell them they already got tickets and leave. Joey & Meghan and Jessica & John get a flight arriving in at 12:05 PM. Mona & Beth arrive at the travel agency... They might not get on the same flight? Bates & Anthony and Chuck & Wynona get on the 12:05 PM flight. Max & Katie, Caroline & Jennifer, Pam & Winnie and Dave & Connor get on the 8:30 AM flight. Bates & Anthony, Chuck & Wynona and Mona & Beth get a flight that arrives at 12:05 PM. Joey & Jessica and Jessica & John get on a different flight that arrives at 12:05 PM. Oh wait... They find a transfer that gets them in at 10:30 AM. 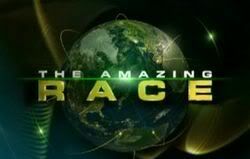 I Caroline & Jnnifer's Amazing Race song. First flight lands. Pam & Winnie want a first. They feel like this leg is "the one". Caroline & Jennifer sing in the taxi. Their taxi driver gives them a thumbs up. Dave & Connor get the first detour clue. Sandy Bottom: Teams will have to collect sand from the bottom of the river and transfer it 200 yards to the brick maker. They have to fill a bucket to a line. Fruity Top: Create a religious offering out of fruit. Then it'll be taken to a temple where it has to be approved. Joey and Meghan are just so annoying. All the first four teams got detour clues. Jessica & John and Joey & Meghan's flight lands. First four teams arrive at fruity top. They all start creating their fruit cone-things. Joey had a little funny roleplay as a monkey. Jessica & John do Fruity Top. Joey & Meghan do Fruity Top too. Mona & Beth and Chuck & Wynona arrive at Monkey Forest... Bates & Anthony's taxi driver says 5 more minutes... but they're lost. But HOW THE HECK DID BATES & ANTHONY POP UP IN 3RD?! Their monkey "bad lip reading" was just honestly bad. I'm starting to get a little annoyed by Pam & Winnie as well, but we'll see how these two work out at the end of the episode. Bates & Anthony get directions to Monkey Forest. Mona & Beth are telling their monkey to eat the coconut... Their monkey goes up into the tree and then drops the coconut. Chuck & Wynona get their clue. Chuck thinks it's a whistle. They pick Fruity Top. Mona & Beth get their clue. For the first three legs, the same teams placed in the top three spots each time. Pam & Winnie are in the first procession. Dave & Connor are in the next procession. Pam & Winnie are done the detour in first. Proceed to Uluwatu Surf Beach for the next clue. Dave & Connor are done in 2nd. John says he and Jessica are detail oriented. Max & Katie are done putting together the offering. Caroline & Jennifer are too. Jessica & John are in the wrong place... But they think it's the right place and they think they're putting together a completely different thing. The local there is so confused... John asks if the local has seen anyone like them yet... The local says no. They find out they're in the wrong place, LOL. Max & Katie and Caroline & Jennifer are done the detour in 3rd and 4th. Jessica & John find the right detour. Bates & Anthony arrive at Monkey Forest. Their monkey is hiding from them. Mona & Beth do the sand detour. Jessica & John and Joey & Meghan are both at the fruit. Chuck & Wynona arrive. Bates & Anthony say the clue container looks like a lipstick... "Maybe the girls left it for us." Gag. They choose Fruity Top. Pam & Winnie arrive at the beach. Roadblock: Who's ready to get totally tubular? Find a surfboard with an image they've seen before... The priest who blessed them in Bora Bora. They have to have the right board to check in. Otherwise, they have to run back to the surf shop and get the right surfboard. Ew. That's a bit of nasty business. Winnie does the roadblock. Connor (obviously) does the roadblock. Max & Katie arrive at the roadblock. Max does the roadblock. Caroline & Jennifer arrive. Caroline does the roadblock. Back at the sand detour... Mona & Beth carry the sand to the bucket. It's heavy. Jessica & John's offering gets rejected. They have to start over. Bates & Anthony arrive at the fruit detour to see the other teams still there. Winnie can't find Phil. She comes back to Connor to ask where Phil is. Connor asks for the board... Winnie won't give it. Connor sneaks a peak and gets it! It's a race to the pit stop. OMG LOL. DAVE & CONNOR ARE THE FIRST AT THE PIT STOP. OMG LOLOLOL. THEY'RE TEAM #1. DYING RIGHT NOW. They won $5000 each!